To the south, palm fronds sway in the afternoon breeze, warm sand and waves beckoning nearby. While to the north, the trees are shedding their leaves high in the mountains. A single highway links them together. Where to head? Let the Vulcan® 1500 Nomad™ decide. However many miles it takes, the Nomad is ready to go there. Its digital fuel-injected 1470cc V-Twin masters slow cruising and fast highways, heat and cold, and high altitudes. The long 65.6-inch (1665 mm) wheelbase lets you and a passenger stretch out and enjoy the special touring frame and suspension, while an adjustable windshield and fork-mounted air deflectors distribute airflow cleanly around you. On your way south, take comfort that your cold-weather gear is locked safely in the Nomad’s spacious saddlebags. Not that you’ll be needing it any time soon. 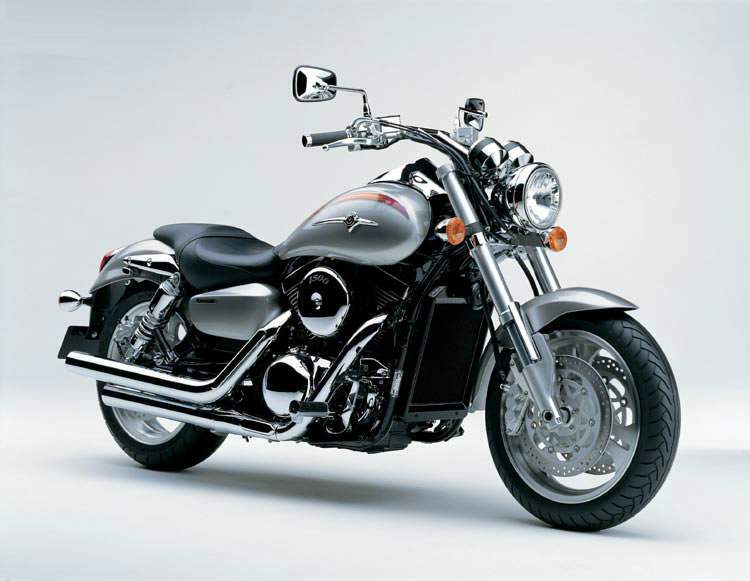 Combining both comfort and good looks, the 2003 Kawasaki Vulcan® 1500 Nomad™ Fi V-twin touring cruiser represents the continuing evolution of the company's Vulcan line. The Nomad's elegant styling, comfortable touring package and performance-oriented features such as digital fuel injection demonstrate that this motorcycle is more than just another cruiser. - The smooth-running 90 cubic inch V-Twin engine develops super strong low-speed engine torque and revs out to deliver the highway-passing power you need when fully loaded. 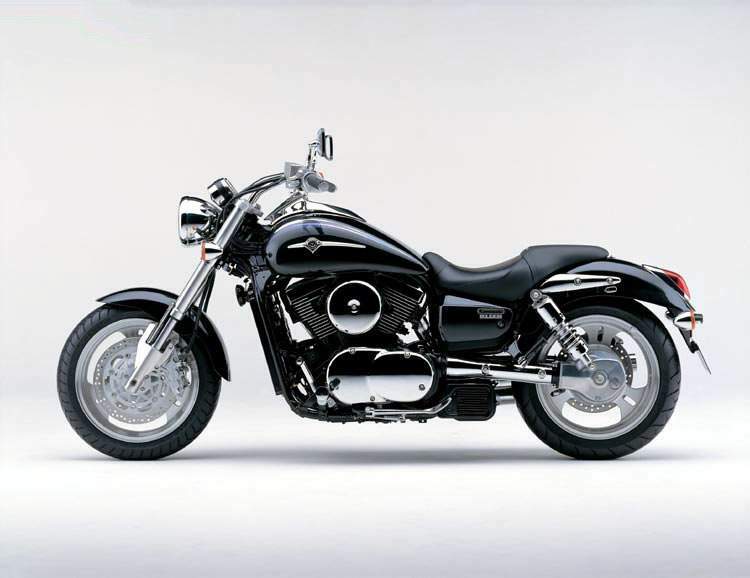 - Kawasaki touring performance includes liquid cooling, 4-valve alloy cylinder heads, lightweight pistons, Single Overhead Cams, dual spark plugs per cylinder and hydraulic valve lash adjusters. - Nomad delivers an ultra-smooth ride thanks to its gear-driven engine balancer, rubber mounted floorboards for both rider and passenger, rubber isolated handlebar and comfortably padded two-piece seat. - Important low-maintenance touring features include: Automatic valve lash adjusters. Automatic cam chain tensioners. Clean, quiet and reliable shaft drive. Strong pressure cast alloy wheels. Tubeless tires. And an exclusive 2-stage KLEEN (Kawasaki Low Exhaust Emission) catalyzer inside the stainless steel exhaust system. - The huge touring windshield, along with the twin fork leg mounted wind deflectors, keeps you comfortably protected from buffeting wind. - The Nomad cruiser’s presence is announced with its bullet-shaped multi-reflector headlamp and stylish chrome windscreen mounts, which allow for 2 inches of windscreen adjustment. - Dual front brakes with 2-piston calipers and drilled rotors, plus a large-diameter single rear drilled disc with 2-piston caliper offer strong, predictable braking performance. - Two huge, lockable side-opening saddlebags carry all your traveling gear, and their sleek design emphasizes the unique retro-touring look. - The electronic speedometer is mounted for clear visibility on top of the fuel tank. The 4.2 gallon (19 litre) flangeless teardrop tank adds to the smooth, clean style. - Twin air-assisted rear shocks let you adjust the spring preload to suit your riding and load conditions. Rebound damping is also adjustable 4 ways. 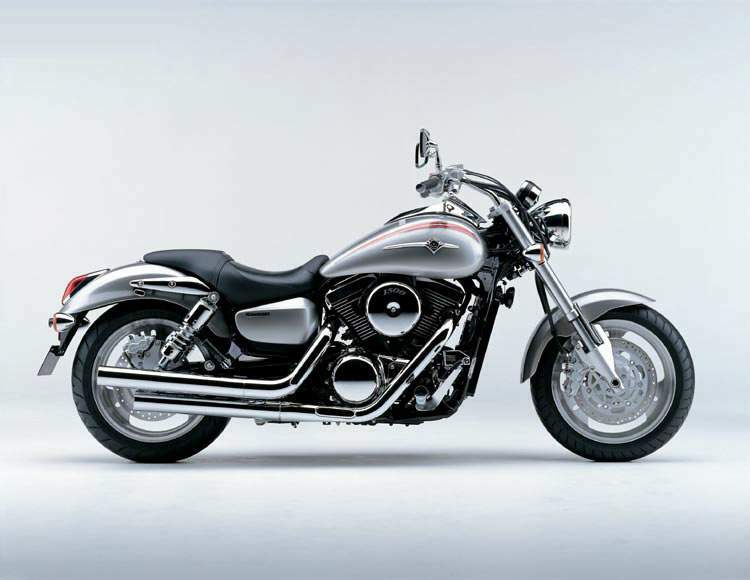 - Express yourself with genuine Kawasaki Fire & Steel™ accessories for your Vulcan 1500 Nomad. A comprehensive line includes chrome plated light bars, front and rear fender trim, saddlebag side and top rails, and a range of comfortable rear backrests.